25 Sweet Child Mary, destined to be the Mother of God and our sovereign and loving Mother, by the prodigies of grace thou lavish upon us, mercifully listen to my supplications. In the needs which press upon me from every side and especially in my present tribulation, I place all my trust in thee. O holy Child, by the privileges granted to thee alone and by the merits which thou hast acquired, be merciful to me this day. Show that the source of spiritual favors and the continuous benefits which thou dispenseth are inexhaustible, because thy power with the Heart of God is unlimited. Deign to grant me, through the immense profusion of graces with which the Most High has enriched thee from the first moment of thy Immaculate Conception, O Celestial Child, my petition and I shall eternally praise the goodness of thy Heart. 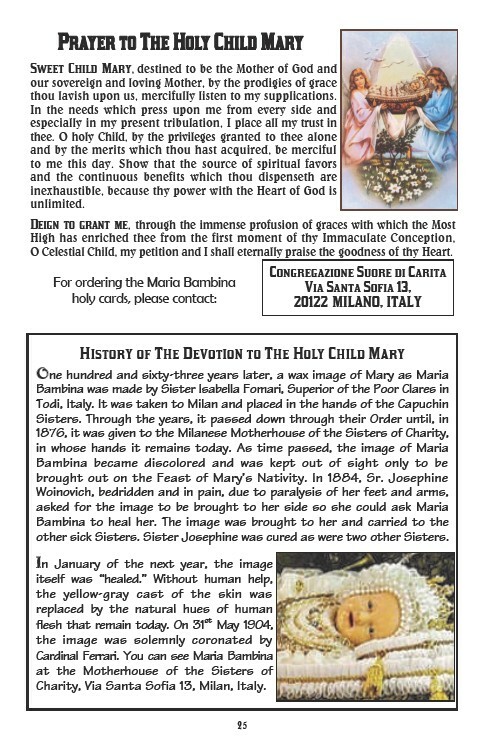 For ordering the Maria Bambina holy cards, please contact: Congregazione Suore di Carita Via Santa Sofia 13, 20122 MILANO, ITALY History of The Devotion to The Holy Child Mary One hundred and sixty-three years later, a wax image of Mary as Maria Bambina was made by Sister Isabella Fomari, Superior of the Poor Clares in Todi, Italy. It was taken to Milan and placed in the hands of the Capuchin Sisters. Through the years, it passed down through their Order until, in 1876, it was given to the Milanese Motherhouse of the Sisters of Charity, in whose hands it remains today. As time passed, the image of Maria Bambina became discolored and was kept out of sight only to be brought out on the Feast of Mary’s Nativity. In 1884, Sr. Josephine Woinovich, bedridden and in pain, due to paralysis of her feet and arms, asked for the image to be brought to her side so she could ask Maria Bambina to heal her. The image was brought to her and carried to the other sick Sisters. Sister Josephine was cured as were two other Sisters. In January of the next year, the image itself was “healed.” Without human help, the yellow-gray cast of the skin was replaced by the natural hues of human flesh that remain today. On 31st May 1904, the image was solemnly coronated by Cardinal Ferrari. You can see Maria Bambina at the Motherhouse of the Sisters of Charity, Via Santa Sofia 13, Milan, Italy.